book review | The Shiatsu Guy Team! This is the 3rd edition of one of the most comprehensive and useful textbooks for serious Shiatsu Students – Shiatsu Theory and Practice. the first edition came out in 1997 and has been a kind of Bible for learning Shiatsu since then. This is the 3rd edition of one of the most comprehensive and useful textbooks for serious Shiatsu Students – Shiatsu Theory and Practice. the first edition came out in 1997 and has been a kind of Bible for learning Shiatsu since then. This edition has been greatly expanded with additional text in the new version, technique demonstration on a DVD-ROM, several new chapters including scientific discoveries and developments particularly around energy medicine, field theory, consciousness and intention. Carola Beresford-Cooke is a respected teacher and author, her roots are in acupuncture but she is firmly allied with Zen Shiatsu, which is probably the most common and popular style of Shiatsu today. 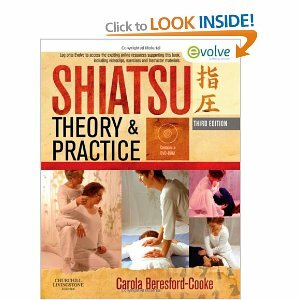 Revised 3rd Edition of Shiatsu Theory and Pracice with improved layout, bigger print and colour photos. Additional chapters for beginner and advanced students of Shiatsu. Lots of theory and advice on practice. DVD-ROM of technique demonstration. Over 100 new pages of content including new theory chapters and and advice for practitioners with approaches to common ailments. Online test questions for revision and CPD. This book comes highly recommended to any student of any style of Shiatsu, and especially if you are a Zen Shiatsu student, as it is particularly relevant to this form of Shiatsu. It is even recommended if you have an older edition of this work, since the new chapters and extra material make this an invaluable addition to your TCM library. Remember that this book is no substitution to full and complete training, but will help you to gain deeper insights and greater knowledge into the theory and practice of Shiatsu. The material in the new scientific discoveries chapters alone makes this a must have for any serious practitioner of Shiatsu, Acupuncture or other Traditional Chinese Medicine modality. Remember it’s not a novel so there is no need to read it cover to cover, use it as a reference and dip in and out where you need to, as suits your knowledge level and requirements.